For companies looking for team building and entertainment, THEY improv provides improv comedy, game shows and murder mystery dinners for entertainment options for a variety of groups and gatherings throughout Illinois. Company-friendly entertainment for Chicago corporate events, banquets and private parties in the city of broad shoulders our specialty. With a variety of shows and team building workshops to fit almost every need, THEY improv is prepared to help you with your Chicago corporate events and private parties. At the capital of show business we provide a variety of entertainment options to make your private parties special. Let THEY improv know the size of your group and we can provide you with ideas and a quote for a tailor-made show to make your Chicago corporate event or private party a success. With a selection of improv comedy, team building workshops and murder mystery dinners, the resorts rock with laughter when THEY improv performed. And in the windy city and the improv capital of the world, working with a top-notch group of performers that can be professional and reflect the highest aspirations of your company is vital in achieving success. With our selection of ambush murder mystery shows, game shows, improv comedy and other forms of entertainment that adapts to your audience, THEY improv has options to meet most any needs. 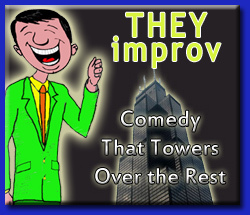 If you are interested in more information, email info@THEYimprov.com or call (312) 254-9930.